Crafted with clean lines and a strong design, this all-in-one sectional features comfort seating and back cushions for attractive simplicity. Select from a microfiber, faux leather or a combination of the two fabrics for a modern living space motif. 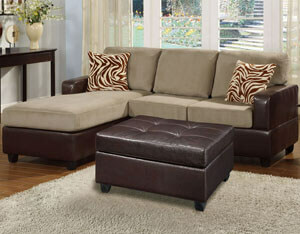 It also includes a colored faux leather ottoman for maximum style. Available in a variety of colors.